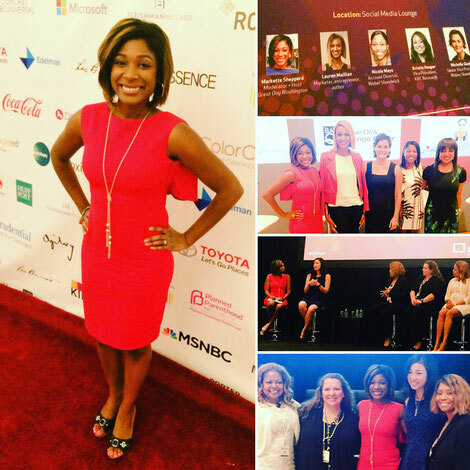 I was honored to host two panel discussions on diversity in the digital age at ColorComm 2016 in Miami. The conference is all about empowering women of color to engage, excel and advance their careers. "Be authentic in your networking" from Nicole Mayo, Account Director at Weber Shandwick for Mattel's Barbie, Hot Wheels and Fisher Price. "If you don't have a seat at the table, you're on the menu." from Delvin Joyce, Managing Director at Prudential and former NFL player. Asking questions are in fact fastidious thing if you are not understanding anything completely, except this article gives pleasant understanding even. There is definately a great deal to know about this issue. I love all of the points you've made. Greetings! Very useful advice within this post! It is the little changes that will make the greatest changes. Thanks for sharing! It's actually very complicated in this busy life to listen news on Television, thus I only use the web for that purpose, and obtain the most up-to-date news. Hello there, You've done a fantastic job. I'll definitely digg it and personally recommend to my friends. I am sure they'll be benefited from this website. Have you ever considered publishing an ebook or guest authoring on other sites? I have a blog centered on the same ideas you discuss and would love to have you share some stories/information. I know my audience would value your work. If you're even remotely interested, feel free to shoot me an email. It's in fact very difficult in this busy life to listen news on Television, so I simply use web for that reason, and take the latest information. Hi, i think that i saw you visited my web site so i came to �return the favor�.I am attempting to find things to improve my website!I suppose its ok to use some of your ideas! !